Also serving communities of Kingwood. There are 7 Assisted Living Facilities in the Morgantown area, with 4 in Morgantown and 3 nearby. The average cost of assisted living in Morgantown is $3,200 per month. This is lower than the national median of $3,346. To help you with your search, browse the 9 reviews below for assisted living facilities in Morgantown. On average, consumers rate assisted living in Morgantown 4.1 out of 5 stars. Better rated regions include Grafton with an average rating of 4.5 out of 5 stars. Caring.com has helped thousands of families find high-quality senior care. To speak with one of our Family Advisors about assisted living options and costs in Morgantown, call (855) 863-8283. The city of Morgantown, located in Monongalia County, West Virginia, runs alongside the banks of the Monongahela River and has a population of 30,364. The town has a relatively small senior population — only 9 percent of the population is age 65 and older. However, the city still has four local assisted living facilities (ALFs) and 24 in nearby towns for aging seniors to receive help with daily tasks. The Department of Health and Human Resources (DHHR), Office of Health Facilities Licensure and Certification (OHFLAC) is responsible for all regulatory compliance plans annual inspections to ensure the safety and security of seniors living here. The cost of living in Morgantown is considered cheaper in most major expense categories when compared to other cities in the country. The cost of groceries, health care services and transportation are all lower than the national average, which could benefit seniors with low or fixed incomes. Summer in Morgantown is known to be hot and muggy with July temperatures reaching as high as 89 degrees Fahrenheit. Seniors may not enjoy going outside when humidity levels are at the highest, which can be as much as 90 percent during the hottest months. The air quality in Morgantown is ranked a 30 on the air quality index, noticeably lower when compared to the national rank of 50. Even better, it's significantly cleaner compared to the state's score of 126. These air conditions may allow seniors with respiratory issues to thrive with little concern. Morgantown has a combined violent and property crime rate that ranks it only safer than 16 percent of other neighborhoods in the nation. Even worse, when compared to other cities and towns within the state, Morgantown is considered 88 percent more dangerous and poses a severe security-risk to seniors. The Morgantown area is home to world-class medical facilities, including Ruby Memorial Hospital and West Virginia University Hospitals, in the event of medical emergencies or illness. Morgantown has an array of community resources for seniors, including the Wills Hill Community Building - BOPARC, an organization that offers residents programs and wellness activities. Assisted Living costs in Morgantown start around $3,200 per month on average, while the nationwide average cost of assisted living is $4,000 per month, according to the latest figures from Genworth’s Cost of Care Survey. It’s important to note that assisted living rates in Morgantown and the surrounding suburbs can vary widely based on factors such as location, the level of care needed, apartment size and the types of amenities offered at each community. Morgantown offers very limited options to seniors seeking aid for assisted living. 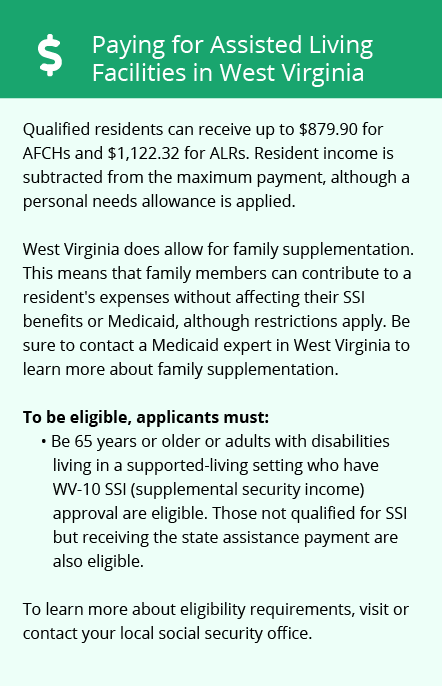 The town does not offer a Medicaid State Plan, but eligible seniors may qualify for the special needs circumstance waiver or Supplemental Security Income (SSI) program. Morgantown West and the surrounding area are home to numerous government agencies and non-profit organizations offering help for seniors searching for or currently residing in an assisted living community. These organizations can also provide assistance in a number of other eldercare services such as geriatric care management, elder law advice, estate planning, finding home care and health and wellness programs. To see a list of free assisted living resources in Morgantown West, please visit our Assisted Living in West Virginia page. 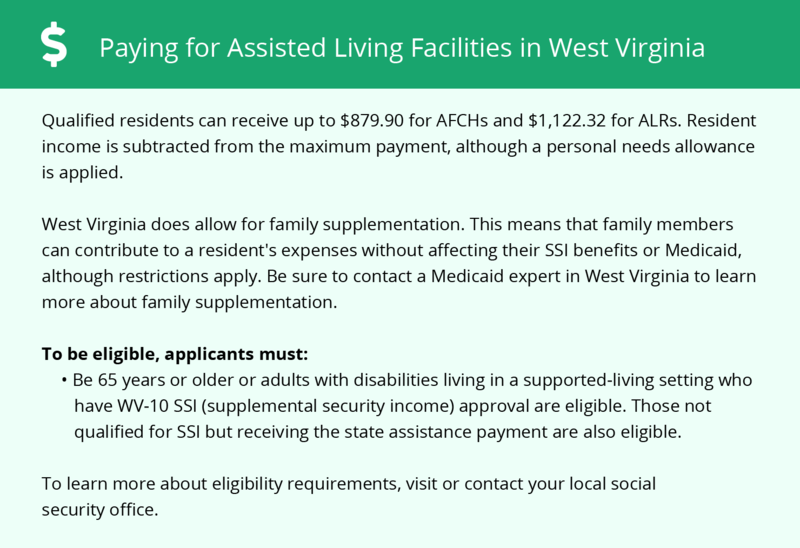 Morgantown West-area assisted living communities must adhere to the comprehensive set of state laws and regulations that all assisted living communities in West Virginia are required to follow. Visit our Assisted Living in West Virginia page for more information about these laws.